We understand you are looking for the Best Airsoft M4 guns. And we are not mixing our reviews with M16 or AR 15. We have reviewed only couple pure M4 airsoft guns for your preference. 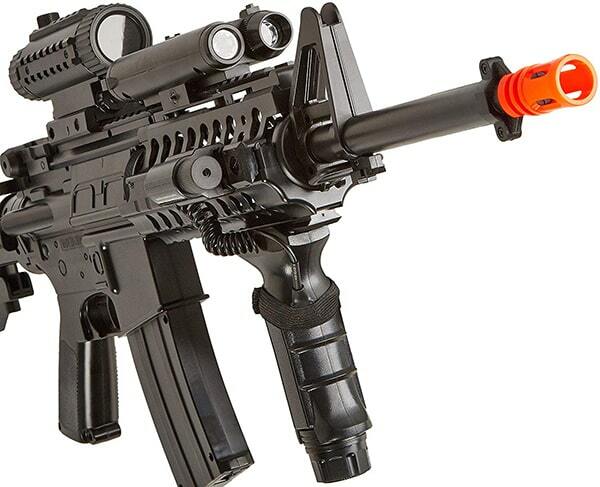 The Trippmann Arms M4 Airsoft gun comes with a full-auto gas powered airsoft gun. The gun doesn’t require any battery. The gun allows you to have a realistic experience and charm you with some incredible features. Its flip-top break down system is similar to a real gun. The gas can be used in multiple ways. By CO2 cartridges or by remote line adapter. The fire rate can be adjusted from 8 RPS to 15 RPS. The velocity also can be adjusted from 300 FPS to 400 FPS. (Using 0.20g BBs). Low maintenance – no gear box. The recoil is very catchy. 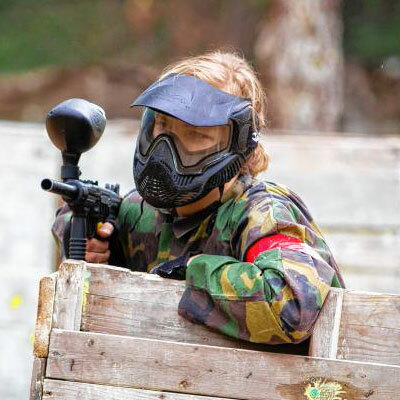 CO₂ capsules, paintball CO₂ tanks, or HPA tanks can be used in the gun either with or without a remote line. A bit pricy, that’s why it might not affordable to everyone. The hop-up can be inconsistent in some rare cases. Q: Does the package include a magazine? Q: What is the barrel length of the gun? A: The barrel is 14.5’’ long. Q: Are the controls similar to a real AR-15? A: Yes, its very similar to a AR15. However, the body is polymer not metal. And hence it is little lighter. Q: What mm bb should I use with it? A: Standard 6mm airsoft bbs. Experts who are looking for a versatile M4 airsoft gun and eager to invest dollars on a best quality gas powered M4 airsoft gun can have a try with the Trippmann Arms M4 airsoft gun. It’ll be a good choice indeed. As the rifle is made of metal, it is heavy in weight but gives a charming experience while playing with it. The rifle has rear iron sight that you can adjust or remove depending on your choice. Probably you should use a 9.6v or even 11.1v battery. Overall, the gun can be taken in any airsoft battlefield. If you are usual to the airsoft game and looking for a great quality CQB gun at a medium price, then I would recommend this one to you. This AEG rifle has many high-end features within a reasonable price tag. Full metal body, including the entire front and top rail system. Adjustable stock is made of durable ABS plastic. A vertical fore grip is attached to the bottom rail on the RIS. Adding optics is easier as the rear sight is a flip up sight. Overall, great value whether you’re a novice or an expert. It doesn’t contain any trademark. Hand guard is made of alloy. Q: Is the upper/lower receiver, barrel, and buffer tube all metal? A: Yes, all metal except the grip. Q: Is the grip removable? DBoys Metal RIS M4 Airsoft AEG is a good choice for those who are looking for a good M4 airsoft gun within an affordable budget range. The G&G Airsoft M4 AEG Combat Machine Raider CQB RIS is a replica of Combat Machines. All the major parts such as front rail, the stock of the gun are made of high quality plastic and the minor and complex parts like the stocks pipe, the tactical sling attachment points, the magazine casing are made of metal. Low price, compact design and lightness in weight made it a best quality M4 airsoft gun. Receivers are made of ABS plastic. Two firing modes: Semi-automatic and full-automatic. Fires at 320-350 FPS with 0.20g BBs. Inner barrel length is 230mm. Contains an ergonomic motor grip. High capacity magazine (450 rounds). Doesn’t show excellence in long range. Q: Which battery should I use? A: 9.6 Volts Nunchuck battery. Q: Does the package come with a battery or a charger? A: No, it doesn’t include a battery or a charger. Q: Which ammo should I use? A: 0.20g or higher models suits most. 0.20g is recommended. Probably, G&G Airsoft M4 AEG Combat Machine Raider CQB RIS is the best M4 airsoft gun within its price range considering performance and durability. It’ll be a wise choice for players who are looking for a good high end airsoft gun in a low price. For entry level airsoft players, the Firepower F4-D M4 is a notable gun with some good features. There’s a RIS system with 4 rails on it which allows you to modify or add some accessories such as lights, lasers and Foregrip. Now, the thing is, all these accessories are included in the package. The airsoft gun works in full auto mode. Shoots at a speed of 200 FPS with 0.12g BBs. Includes a tactical flashlight with the gun. The gun holds almost 500 BBs at once. The gun is not highly long-lasting if not maintained properly. Q: Does the package include a battery and a charger? Q: Which BBs do you recommend for this gun? A: We recommend 0.12g BBs for this gun. Q: Is the stock adjustable? As this is a M4 gun for beginners, this can also be a good choice for the practice session of the pro level players. You can modify it with the materials you like. If you are looking for an airsoft M4 gun at a super low price, GRAB THIS! 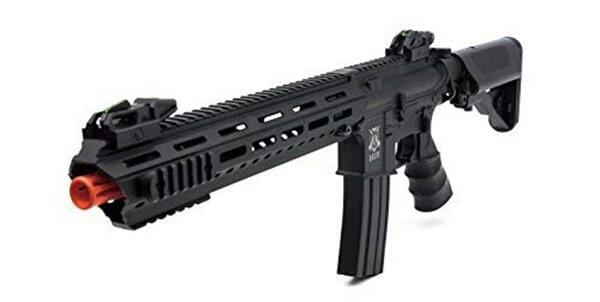 M4 Viper MK5 AEG Airsoft Rifle by Black Ops is a competitive, solidly constructed AEG that looks great and shoots much better. With fiber optic flip up sights, a free-floating, speedy release rail system, along with a flexible crane stock, this rifle is ready for battle straight from the box. Having a lightweight receiver designed for durability, and internals intended for precision, the M4 Viper Mk5 produces around 420fps with .12g BBs, also contains a 8.4v 1100mAH battery. The M4 Viper Mk5 is also a good platform for updates and customization, compatible with the majority of M4 internals and with lots of rail area for optics, grips, lighting, and additional accessories. Q: Is it a semi automatic or full auto? A: It has both semi and full automatic settings. Q: Is it plastic or metal gun? A: Plastic outside but metal gears. Q: Battery and charger included? Q: What is the fire rate? Here’s a M83 that’s a M4/M16 replica airsoft rifle from BBTac. It’s a light weight gun assembled out of durable ABS plastic. This makes it effortless to carry and move around. There’s a flexible LE stock in addition to removable barrel extensions to transform it to some CQB design airsoft rifle. It comes packed with accessories like a flashlight, foregrip, detachable carry handle and red dot light scope. There’s a adjustable hop up, has semi automatic, full-auto, and security settings. It fires in roughly 250 FPS with 0.12gram 6mm BBs. In general, this rifle is excellent for backyard wars or target practicing. It’s a great selection for beginners to have a sense of airsoft, but don’t wish to invest hundreds of bucks in the beginning. Long battery life and not drained when you are not using it. We are sure this hand picked bast airsoft M4 guns will help you to choose the best one for you without confusing you. Let us know your feedback in comments. Will appreciate.